Made to Measure Coloured Glass Splashbacks. CUT TO FIT A COOKER HOOD SHAPE? You can type in a colour if it's not listed. To post us something, for us to match the colour to. Type in "will post in sample" into the colour choice box. * Orders under 2.4m in panel size. Excludes Highlands & Channel Islands. Highlands & Channel Islands delivery charge is available at £39.99. For sizes that exceed 2.4m contact us, we'll need to get a quote from the couriers. Not available in low iron so lighter colours may be affected by the natural green tinge of glass. Other sizes available. Email us if you have specific requirements. *If your required shape isn't listed you can send us in a template. For custom shapes and socket cutouts etc... email us a diagram when ordering. 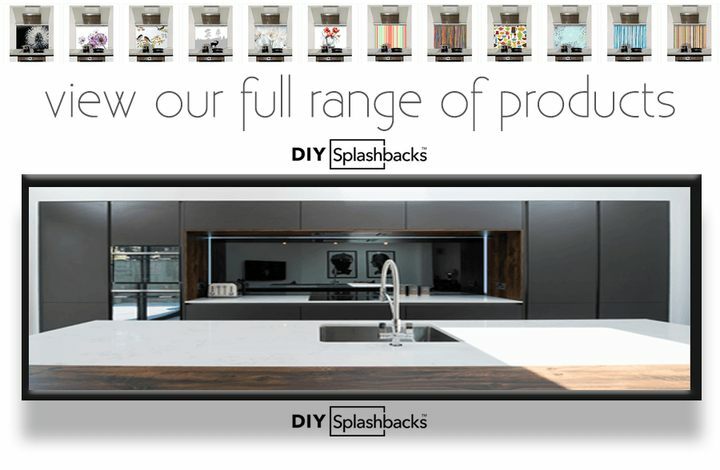 At DIY Splashbacks, we believe that your kitchen splashback should fit your lifestyle. This is why we offer the opportunity to customise and personalise all aspects of your splashback from its colour to its shape. 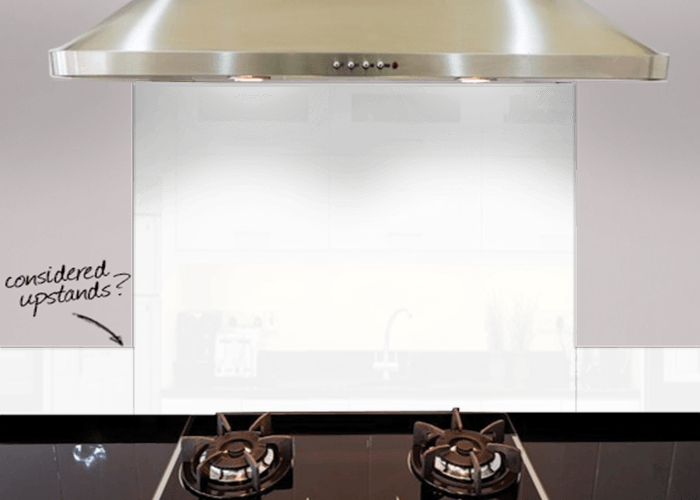 Once you've chosen the splashback for your kitchen, we provide a variety of easy fit options to complete your look. Our service includes comprehensive and easy to follow Tutorials for DIY splashback measurement and installation that will ensure your kitchen has a professional finish. Glass upstands Usually 100mm tall, and fitted the same way as a splashback, upstands add a touch of colour along with more practical wall protection. Measuring for your upstands is just as easy. When you make your measurements, ensure you allow for an expansion gap of 2mm between your upstand and where you want your upstand to finish. There's no need for a gap between your upstand and your splashback. This will ensure that you get the best possible fit for your kitchen! Once you've added the splashback of your choice to your basket, just input the lengths of the upstands you would like, get your new quote and add these too! Don't worry, after adding your items to your basket, you can review and edit them at checkout to make sure you've got everything you need. If you've any questions, we'll be happy to help. 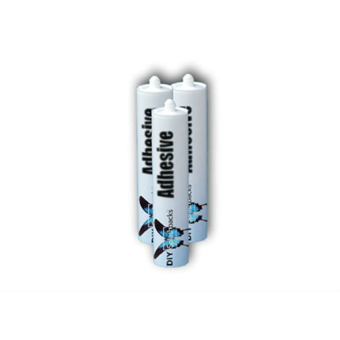 When your upstands arrive, it's just a matter of preparing and using our adhesive to attach and seal them to your wall, and your new look kitchen splashback will be finished. Fully fitted Glass Splashbacks Fully covered walls of coloured or printed glass are less of a DIY task and more the work of skilled tradesmen and kitchen fitters. There is very little room for error with toughened glass as the glass may not be cut or drilled once toughened. However, fully fitted glass splashbacks brighten up kitchens and look simply stunning once fitted. 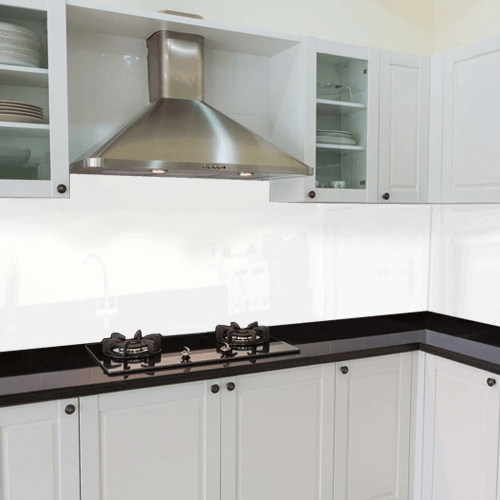 As experts in glass, we also offer a full measuring and fitting service for glass splashbacks. Our network of fitters work across mainland UK offering a truly comprehensive service. We'll take care of everything from design to installation, giving you peace of mind that the job will be done right. Click here to find our more or call our dedicated call centre on 0808 2540007 (Monday - Saturday 9-5). 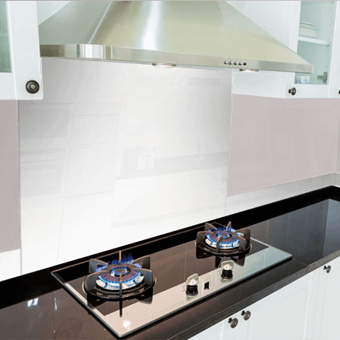 Brushed Glass Splashbacks have a more scratch resistant, non reflective, matt glass finish but are not available in low iron so lighter colours may be affected by the natural green tinge of glass. The below sizes are in stock ready to be coloured- these sizes are generally delivered in around 1 week. Any shaped splashbacks, splashbacks with holes, thicknesses other than 6mm and made to order/bespoke sizes typically take 2-4 weeks as long as they pass quality control. Shaped panels take the longest duration as the manufacturing process is more complex and made using a CNC. All of our coloured and printed glass splashbacks are manufactured using low iron glass, also known as optically clear glass. Low iron glass has, as the name suggests, a low iron content (not completely iron free)- so generally speaking colours viewed from the front of the glass are more or less the same as colours on the back. However, as the colours and designs are on the rear of the glass there can be differences in colour due to light refraction and reflection i.e. the colour can be affected by the colour of the light in the room. Thicker glass will affect the colours more as there is more glass to refract and reflect the light. Glass upstands perfectly compliment a glass splashback. Made to measure from toughened glass our glass upstands are a low cost solution to finish your kitchen walls. NB Coloured Glass upstands can only be purchased with a Coloured Glass Splashback.